We are the students involved in the Teen Cancer America club at Trevor Day School, in New York, NY. 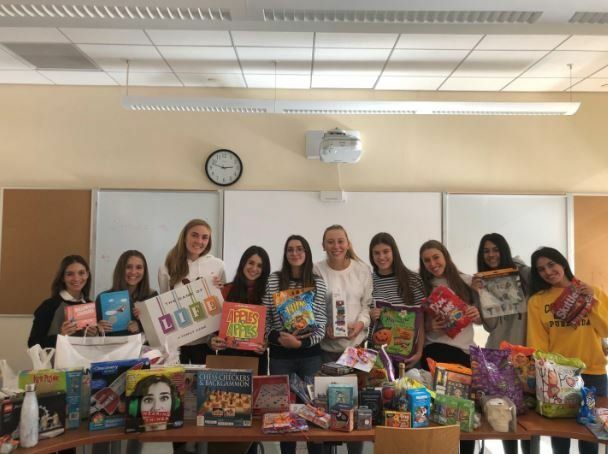 We made it our mission to collect gifts for the teens at Memorial Sloan Kettering Adolescent and Young Adult Cancer Program. We collected games, Halloween goodies, and lots of candy for the patients at MSK. As teenagers, we cannot imagine what they are going through and want to do anything to improve their hospital experience. Hopefully we can give gifts knowing what teenagers like and dislike as other generations cannot always relate. We have had students in our community affected by cancer and we want to be as supportive as we could possibly be. I think we take for granted how fortunate we are and we would like to give other teenagers a chance to take their minds off of what they’re going through. The TCA club was introduced to Trevor Day School by Arielle Cohen, the wife of Zachary Cohen who is a board member of Teen Cancer America. From the day they met, Arielle started attending Teen Cancer America events and immediately saw the impact it was having. She wondered how she could personally get involved. As a high school math teacher, she saw the perfect opportunity to raise awareness amongst her students. For the last 6 years, Arielle has been an ambassador in NYC helping fundraise and hosting events. Thank you to the students at Trevor Day School and many thanks to Arielle and Zach Cohen for being such a big part in getting everyone involved!